This Current Concepts course will highlight the recent developments regarding diagnosis as well as medical and surgical therapy of common eye diseases. 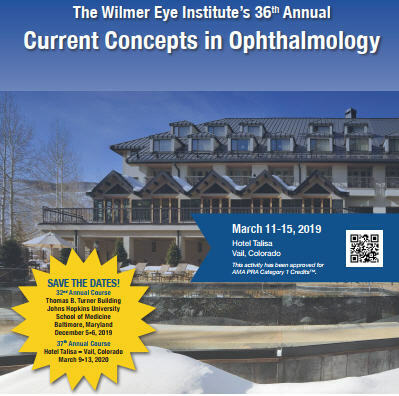 The participant should get a comprehensive review of the most current concepts in the management of ophthalmology by experts across the breadth of the field. For example, clinical trials and other evidence in the peer-reviewed literature over the past few years have changed the approach to managing cataract including IOL technology and femtosecond assisted laser cataract surgery, corneal disease including dry eye disease, keratoplasty, and collagen cross linking, glaucoma and minimally-invasive glaucoma surgical devices, as well as diabetic retinopathy, macular degeneration, and retinal vein occlusions. Furthermore, the role of optical coherence tomography (OCT) and other imaging advances are expanding the understanding of the anatomy of the anterior and posterior segment of the eye. This course will address the ongoing pattern of registrants with repeat requests for demonstrations of the latest surgical techniques and medical therapies, questions regarding practice management issues and clarification of legislative updates. There is a demand for expert education of new techniques and medical therapies as well as the need for elucidation of associated clinical trials, and this course provides extensive coverage of that. A $50 late fee applies to registrations received after 5:00 p.m. ET on March 5, 2019. A handling fee of $50 will be deducted for cancellation. An additional fee may apply for cancellation of other events, including workshops and social activities. Refund requests must be received by fax or mail by March 5, 2019. No refunds will be made thereafter. Transfer of registration to another Johns Hopkins activity in lieu of cancellation is not possible. Integrate prescribed medical and surgical treatment options into everyday practice. Assess the perioperative use of antibiotic and anti-inflammatory agents in patients undergoing eye surgery. Examine external legislative and internal practice issues impacting the field of ophthalmology. Formulate current and advanced medical and surgical treatment strategies as well as imaging with corresponding ocular conditions, including: glaucoma, retina, anterior segment including "dry eye", uveitis, refractive surgery and laser assisted cataract and corneal transplant surgery. Discuss new medical techniques, therapies and relevant clinical trials. Evaluate emerging literature on the efficacy, safety, and cost-effectiveness of femtosecond-assisted laser cataract surgery. Summarize the latest developments for the management of anterior and posterior segment problems. Assess the latest developments for the management of pediatric ophthalmology and strabismus conditions. Describe unique considerations for cataract surgery in patients with comorbid glaucoma. The Johns Hopkins University School of Medicine designates this live activity for a maximum of 29.50 AMA PRA Category 1 Credits™. Physicians should claim only the credit commensurate with the extent of their participation in the activity. American Academy of Physician Assistants (AAPA) accepts certificates of participation for educational activities certified for AMA PRA Category 1 Credit™ from organizations accredited by ACCME. Valet Parking is available on site for $30/night for registered hotel guests. Roundtrip ground transportation available from either Denver or Vail-Eagle Country Airport to Hotel Talisa via Colorado Mountain Express, the official ground transportation agency for this activity. Reference Group code “JHU19” when making your reservation via phone. Convenient and discounted ski and snowboarding equipment rental is available at Venture Sports located in the lobby level of Hotel Talisa. Practice Management: Washington Legislative Update for Ophthalmology 2019* Nancey McCann *This session is not eligible for AMA PRA Category 1 Credit™. Stem Cell Clinics Treating Eye Disease: Disasters and Controversies in U.S. Practice Management: Washington Regulatory Update for Ophthalmology 2019 *This session is not eligible for AMA PRA Category 1 Credit™. Practice Management: Ophthalmology Hospital and ASC Administration Challenges for 2019 *This session is not eligible for AMA PRA Category 1 Credit™. Keratoprosthesis: How Has Technology Changed? Initial Treatment of Diabetic Macular Edema: Why Anti-VEGF Instead of Laser or Corticosteroids? How Many Initial Doses? What to Do About Persistent Diabetic Macular Edema: Laser? Corticosteroids? Other? Practice Management: Ophthalmology Clinic Administration Challenges for 2019* Cathy Kowalewski, MBA *This session is not eligible for AMA PRA Category 1 Credit™. Some Common Questions with Intravitreous Injections: Does Prior Vitrectomy Influence Intravitreous Injection Effects? What’s the Relationship of Changes in OCT to Changes in Vision in DME?